In the course of donating to, volunteering for, accepting the services of, or doing business with the program, you may be asked to provide your name, e-mail address, postal address, telephone number, fax number, credit card information as well as other data required by government regulations. We collect only the specific information that is necessary, and which you provide voluntarily, as a condition of your transaction with the program. WE DO NOT SELL, RENT, OR SHARE PERSONALLY IDENTIFIABLE INFORMATION WITH ANY THIRD PARTY except as specifically required by the transaction for which it was provided voluntarily to St. John’s Food for the Poor Program. We may use personally identifiable information: (a) to facilitate the transaction for which it was provided; (b) to respond to your inquiries or questions about our services and transactions; (c) for internal marketing purposes and as part of our donor database; (d) to provide you with additional and updated information, materials and other advertisements regarding our services; (e) to cooperate with government officials or parties in litigation under process of law, or as otherwise required by law; and/or (f) to protect the integrity and safety of our organization and its donors, volunteers, vendors, agencies, clients, employees, and website visitors. St. John’s Food for the Poor Program also collects certain “non-personally identifiable information” when you visit our web site (http://stjohnsfoodforthepoor.org/), such as your browser program, your computer’s operating system, the domain name of your Internet service provider (but not your user name or e-mail address) and aggregate data about the number of visits to the web site, average time spent on the site and pages viewed. The program uses this information for internal review only in an effort to measure site usage and improve site content. 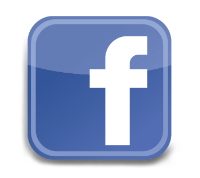 This information is never shared with other organizations for commercial or charitable purposes. In addition, St. John’s Food for the Poor Program does not use “cookies,” which are very small data files that are stored on your computer’s hard drive and are used to enable specific browsing features. These files do not contain, nor do they reveal, any personally identifiable information. Nevertheless, “cookies” have caused concern about the privacy of Internet browsing and the program chooses not to use them. 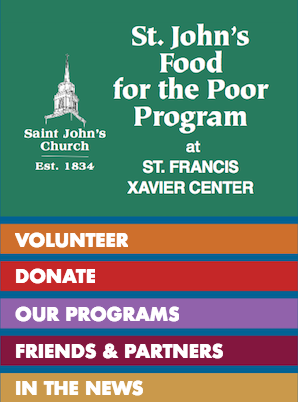 St. John’s Food for the Poor Program protects your online donation information by using online security technology provided by PayPal, an acknowledged leader in online commercial payment transactions. The donor is directed by hyperlink from our website to PayPal, where the donation transaction is processed. The technology employed by PayPal encrypts your data to avoid the decoding of information by anyone other than Authorize.net and PayPal. This technology is considered highly effective. Nevertheless, such security measures may not prevent all loss, misuse, or alteration of personal information provided by you in the transaction. St. John’s Food for the Poor Program IS NOT RESPONSIBLE FOR DAMAGES OR LIABILITIES RELATING TO ANY ONLINE TRANSACTION SECURITY FAILURES. If you provide personally identifiable information to the program by e-mail, please be aware that normal e-mail is not encrypted. E-mail and other electronic communications may be accessed by unauthorized third parties when sent over the Internet. If you include personally identifiable information in an e-mail to the program, you authorize us to respond to you with an unencrypted e-mail message that may contain the same or other private information about you or your request. St. John’s Food for the Poor Program IS NOT RESPONSIBLE FOR DAMAGES OR LIABILITIES RELATING TO ANY ELECTRONIC COMMUNICATIONS TO OR FROM THAT ARE INTERCEPTED BY THIRD PARTIES DURING TRANSMISSION OVER THE INTERNET. Our website contains links to other websites that may be of interest to our visitors. 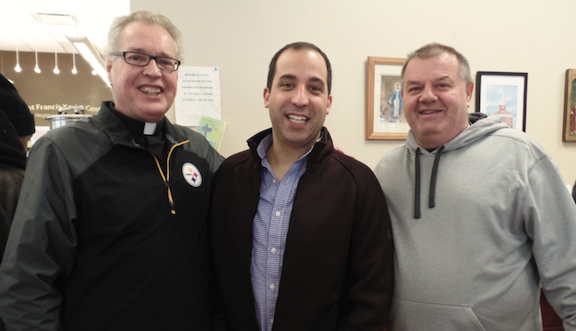 St. John’s Food for the Poor Program receives no income, reimbursement, or any other consideration for providing these links. While we strive to link only to web sites that share our high standards and respect for privacy, the program is not responsible for the content or the privacy policies of these other web sites.